"Bartletts are excellent for this but others will do also. Pick pears that are slightly underripe." Preheat oven to 350 degrees F (175 degrees C). Grease 14 muffin cups. Whisk flour, 1/2 cup sugar, baking powder, 2 teaspoons cinnamon, nutmeg, baking soda, and salt together in a large bowl. Whisk buttermilk, oil, eggs, and vanilla extract in a separate bowl. Pour in flour mixture; mix just until moistened. Fold pears and chopped walnuts into the batter with a few quick strokes. Spoon batter into the muffin cups, filling them to the top. 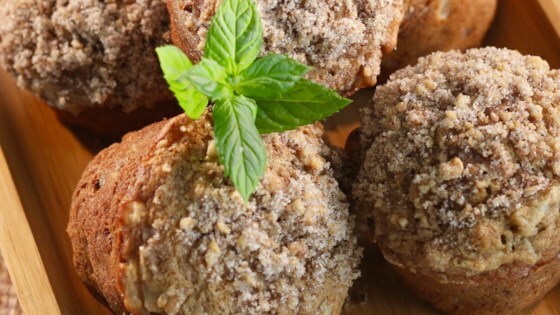 Mix 3 tablespoons sugar, ground walnuts, and 1/2 teaspoon cinnamon together in a small bowl to make topping. Sprinkle topping evenly over batter. Bake in the preheated oven until a toothpick inserted into the center comes out clean, 20 to 25 minutes. Place muffin tins on a wire rack; cool for 5 minutes before removing muffins.